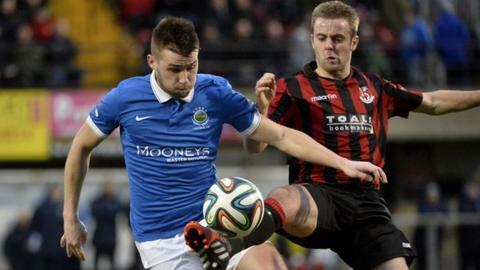 Linfield are to play their postponed 'home' Irish Premiership game against Crusaders at the Oval on Tuesday 21 April, with a 19:45 BST kick-off time. The match was scheduled to take place at Windsor Park on 4 April but was called off after the discovery of structural damage to the West Stand. The Crues are nine points clear of the Blues at the top of the table, with a vastly superior goal difference. The north Belfast club should seal the league title at Seaview on Saturday. Stephen Baxter's charges celebrated after Saturday's derby win over Cliftonville left them in a seemingly unassailable position at the top of the table with three games left to play. The Blues lost 2-0 to Glenavon in their match, which was played at Ballymena Showgrounds because of the ongoing assessment of the extent of the damage at their Windsor Park home. The Lurgan Blues lie four points behind Warren Feeney's outfit and are threatening their second position in the league. The Irish Football Association are waiting for the results of a structural engineers' report into the condition of the West Stand at the national stadium. The report should shed some light on whether the stand can be refurbished and included in the new redeveloped national stadium, or if it will have to be flattened. The stand and surrounding area have been sealed off in recent weeks amid reports of possible subsidence and cracks in its structure. The problem has also led to a change of venue for the Irish Cup final, which will now see Glentoran face Portadown at the Oval on Saturday, 2 May.